Gangs of Wasseypur is relentless in its ability to entertain, and that’s possible purely because of highly accomplished film-making. A new template for the Indian blockbuster. If you don’t have an academic bent of mind and you wish to be entertained, this movie is obviously not for you. But beware; GOW is not for the weak-hearted. So, hold on to your guns, gamchas and 'womaniyas'. Gangs of Wasseypur is a heavyweight knockout punch. You’re down for the count! A dizzying explosion of an Indian gangster film, whose epic structure and colorful, immoral killers capture the imagination for over five hours. 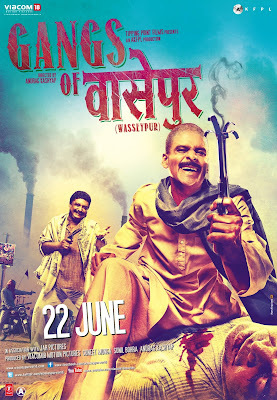 "Gangs of Wasseypur" is a brilliant collage of genres, by turns pulverizing and poetic in its depiction of violence. GANGS OF WASSEYPUR symbolizes the fearless new Indian cinema that shatters the clichés and conventional formulas, something which Anurag Kashyap has come to be acknowledged for. Even though there’s so much going for GOW I, there’s something always amiss, something that leaves you underwhelmed after all those expectations. Kashyap gets flavour, setting and character right, but the lack of economy cripples the film. There is a lot of gunfire, but like the fine actors populating its sets, Wasseypur fires too many blanks. Despite its occasionally indulgent narrative, this bullet-ridden saga is worthy of a repeat viewing, if only to catch all its nuances. Don’t miss it.